I have had just four days in my new school (Mondays and Fridays until I start full time in September). After finding my way around the school, meeting some of my new colleagues and having a nosey at what the English team have been up to with regards to KS3, I have largely been holed up in the English store cupboard, with its comforting smell of old books, working on my redesign. On my first day I talked at length with my Head of Department about my ideas. He was sold on nearly everything except the sequential teaching of texts. As a Lead Practitioner I have been given a lot of freedom but ultimately it is his decision and I therefore needed to compromise. Whilst I haven’t been able to implement sequential teaching of texts over the whole of the KS3 course, I have thought much more carefully than I might have done about the order in which texts are studied within each year. The sequence is by no means perfect but I think there are some clear links and an order that will hopefully aid students’ understanding of contexts (e.g. studying ‘The Boy in the Striped Pyjamas’ will be followed by War Poetry). The other compromise with the redesign was, quelle surprise, budget. I could not just select texts from the ether and, instead, was limited largely by what was already in the store cupboard. There will be some money made available for buying extra sets but the budget is tight due to a new KS4 curriculum and the other usual budgetary demands on the English Department. 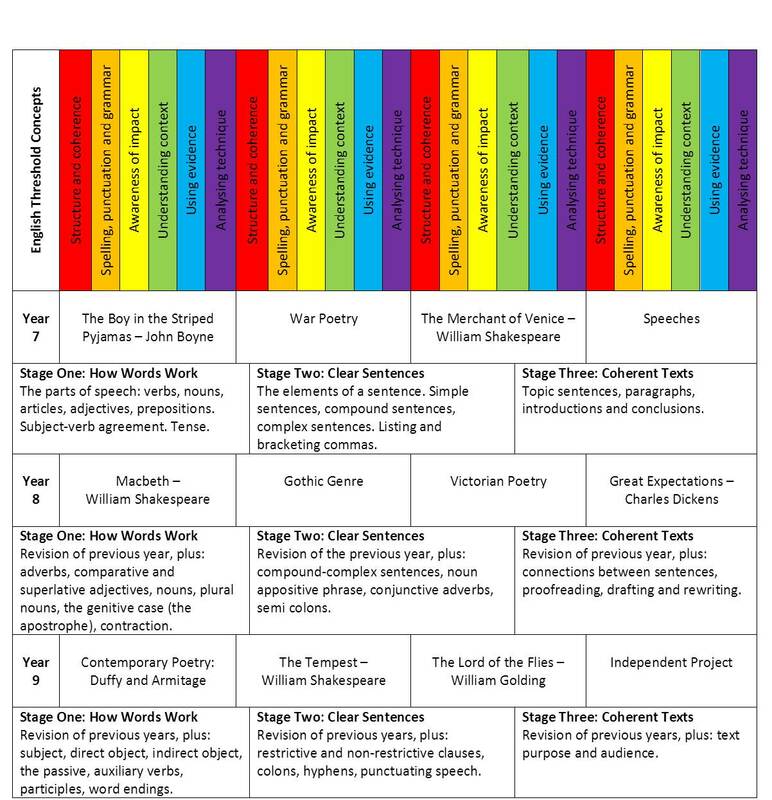 However, I have managed to include challenging texts and where we’re studying genres or poetry we will be able to collate and explore a range of texts. I make no apologies for studying a Shakespeare play every year but I wish there had been some more modern play texts in the cupboard. Emerging from my second day in the cupboard I got the green light for my draft redesign from the Head of Department and subsequently the Principal (also an English teacher). So, please see below what I have put together. I would welcome any feedback/constructive criticism. This is an overview document. You can’t see from this that within each unit we are interleaving English Literature and English Language skills (e.g. transactional and creative writing; analysing non-fiction texts etc.). What you can see is that there are only 4 units for each year – approximately 10 weeks – to encourage greater depth and breadth of study than trying to cram everything in to whatever length a half term is. What you will also see is David Didau’s English threshold concepts and Daisy Christodoulou’s decontextualised grammar drill in the teaching sequence she suggests.The latter is not something I’ve done before but, given the literacy skills in the context of the school I’ll be teaching in, I think it is important. Our KS3 pupils will have a discrete grammar lesson a week. Whilst I’ve mapped out the ‘What’, and addressed the ‘Why’ in my first post, I think what will be important in the implementation of the KS3 curriculum is the ‘How’. I feel that, through Twitter, I’m now plugged into a wealth of fantastic ideas. As a snapshot of my thinking, for the grammar lessons I’m currently exploring mastery learning techniques and Eddie Kayshun’s Spaced Learning ideas. I also think that we need to consider ways to teach vocabulary and love these 10 minute vocabulary lesson ideas from Marilee Sprenger. You might be wondering what I’m planning to do about homework… I’m not a fan of homework. I don’t doubt that there are colleagues, departments and schools that set homework that is fantastic and helps students to progress. Nevertheless, I can’t help but question the utility and impact of homework in general. Oftentimes teachers set homework because they have to (perhaps according to a whole school rota that is monitored on an online platform) and spend a lot of time chasing students for incomplete homework or using up their precious lunch time to hold catch up detentions (I won’t even mention the additional marking that is generated by homework). A proportion of students who have handed in their homework have likely rushed it or, worse, copied. What’s the point? So, no homework. Well, sort of. I want to encourage our students to read, read for pleasure and read widely. That is the homework we’ll be setting. I don’t want to get bogged down in reading logs – I’d far rather we were engaging in discussions with students about their reading – but I will be making some use of the Accelerated Reader programme. I’m also going to explore ways in which we can guide students to appropriate texts, encourage reluctant readers (campfires and dogs?) and share recommendations and reviews. Tomorrow I will be presenting the new KS3 curriculum to the English Department. Wish me luck. I hope it will be received positively but I understand that this is a massive change to what they’ve been doing for years. Change is daunting but I’m going to do my best to bring them on board. Next Entry What if, like teachers, MPs had performance related pay?